Thanks Sarlock for the reminder and the suggestions. SMSC is once again back. If someone see that I forgot to close the nominations and start the poll also send me a message. This is a mostly residential town just outside of Oakland in the San Francisco Bay Area. Unfortunatly, It has not received as much development as in the surrounding cities. It is still using Leyland Atlantean Busses. These were introduced way back in 1958. The year is now 1981. The town does have a train link to Oakland which is very busy carrying passengers from the east. A new high speed link has also been built using the brand new Advanced Passenger Train. Moraga has not benefited though as the trains zoom past without stopping. 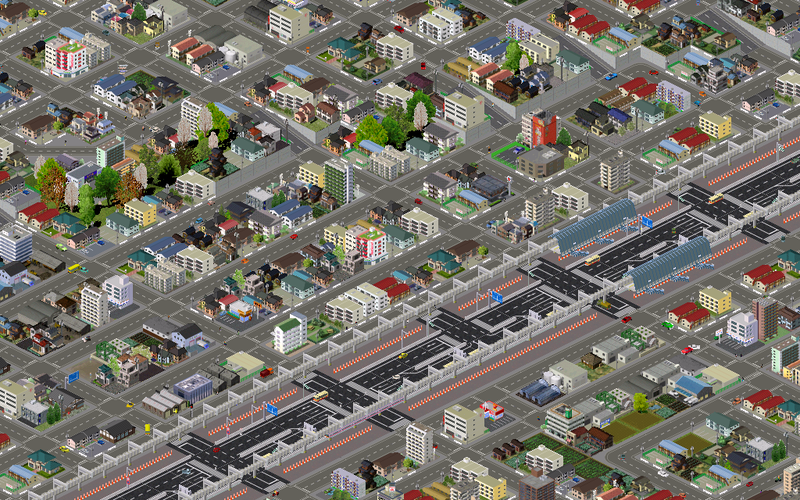 This residental town is just next to centre of the city of "Eekin Diktatuuri" which is capital of my own map. Citizens can use bus or tram to get to the railway station or airport to connect cities all over the map. Nearest city "Eekin Nizza" is in the north and local citizens go there to have pleasant holidays next to the sea of Eeki. This is a screenshot of my playing map. the road had heavy traffic jam by bus so the new monorail started　service above the national road. Pak128.Japan with addons from Japanese Wiki and SIS Project. OOOOO! I really like the go straight on and the right turn arrows and lanes on the highway. They look really cool. Are they just a standered feature of Pak128.Japan or are they an addon? The newest installment of images from Sarlock's pak64 scale pakset project (yes, this is pak64 size). Everything in this image is faithfully reproduced at a 10m/tile scale. These are parts of a larger project which I have been working for over two years on and have finally enough pieces constructed and experience with Blender that things are falling in to place very nicely now. There are 4 different residential house designs in this image, on 4 rotations each. The gas station was my newest creation. The river is using a rocky shore slope creation that I have been working on for months, trying to get it to look right. In the top left is a pond with lily pads. The forest buffer along the center of the image, by the 4-lane road, are 2x2 curiosities. I have been experimenting with forest transitions as buildings rather than placing individual trees, as the dense forest edge foliage is hard to recreate any other way. Once the border is established, the existing forest tools make a nice looking forest (see to the north of the river). Nice to see what Simutrans can do... and I am only just getting started! 61 years ago, Mende was a middle_sized, sleepy town. Then came the tramway. The city grew, and with the advent of modern planes, entered a new era. It's isolation was no more. When the Humberto Circus did settle here, this part of the town was still an empty plain; for the owner, the extension of the tramway has been a mixed blessing : more Mende Citizens enjoy the show, but also many houses were built, which stressed the animals. The airport, built far from town, and along the lake, begins to be surrounded also, causing more noise and safety problems, price to pay to be no more isolated. Real Game, began in 1910, with PAK128 and all SNFOS add-ons. Photo taken in 1971. Not much SNFOS things visible here, though.